These symbols are the remained spaces left after omitting alphabets from an abbreviation, KOPUS. So they are not characters, in the strict meaning, but the shadow of character, the background of character, furthermore, the characters actually not existed. Now let's convert our concern to the sphere invisible It is the reason why books exist in the world, at the same time, it is the reason why we publish books. Green color is the color of nature. This symbol puts our hope into resembling nature's mysterious energy developed from the harmonized operation of the universe. Grey color is created by the harmonization between black light and white light. It symbolizes publisher's will to express the balance and harmony of world without being biased to one part. Light yellow color expresses power and energy that we all earnestly want to have. Blue color contains our sincere hope to exist forever a young, new publisher. Red color expresses our eternal will to publish book with new passion at all times. The two diagrams, green triangle and grey circle, are the head part, express the introspecting attitude groping directions which publishers should follow. In other words, they express publisher's mind to delicately approach to the various symptoms in this changing world. Yellow pillar and blue pillar are the body out of total logo, symbolize the actual pillar consisting of Korean Publisher Conference, in other words, many members with diversified characteristics. This logo is a living creature like a fish moving actively and abundantly, and has the shape like a train advancing to a goal with explosive energy. The reason why we form CI utilizing several diagrams instead of one is to express our support for the diversity of publication and the dynamic movement derived from the diversity. 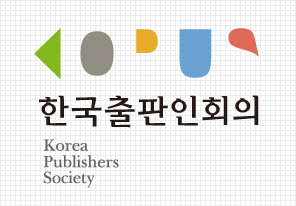 Korea Publisher Conference, symbolized by new CI, plans to be a young organization to record the history of publisher correctly who are living together with book, and to speak for the dynamic future of publisher. Moving Images declaring the new CI of Korean Publisher Conference.